This URL isn’t presented in the start menu/modern UI or particularly obvious after the installation. If you’re setting up a greenfield environment the URL above should get you straight to the new Exchange 2013 Admin Center. Configuring send as, send on behalf and providing full access to a mailbox are fairly common requests. 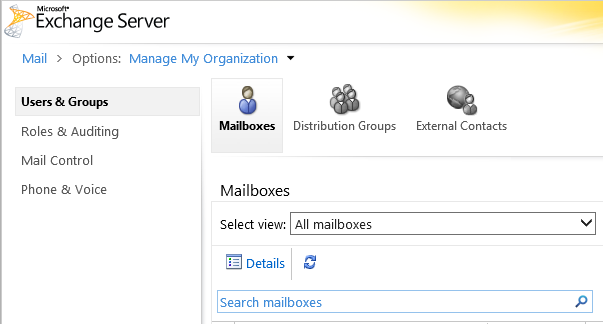 In Exchange 2010, you could set the send as and full access permissions by right clicking the user in the Exchange Management Console under recipient configuration and mailbox. 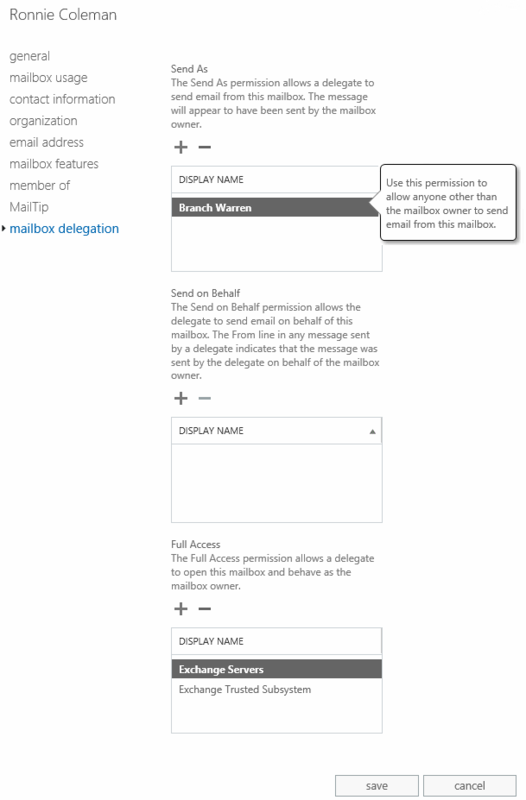 Send on behalf required you to dig a little deeper into the configuration, and head into the users properties, mail flow settings tab and delivery options. In Exchange 2013 they have moved these options into a single location, which seems sensible. We’ll look at how to achieve the above with the GUI and Powershell in Exchange 2013. Open EAC (Exchange Admin Center), browse to recipients, select the user you would like to grant the permission for and click the pencil to edit. In this example, I would like to grant Branch Warren the right to send as Ronnie Coleman so we select Ronnie and choose edit. Choose the option mailbox delegation at the bottom and add the user you wish add the permission to. In this example, we want to grant Branch Warren the right to send as Ronnie Coleman. 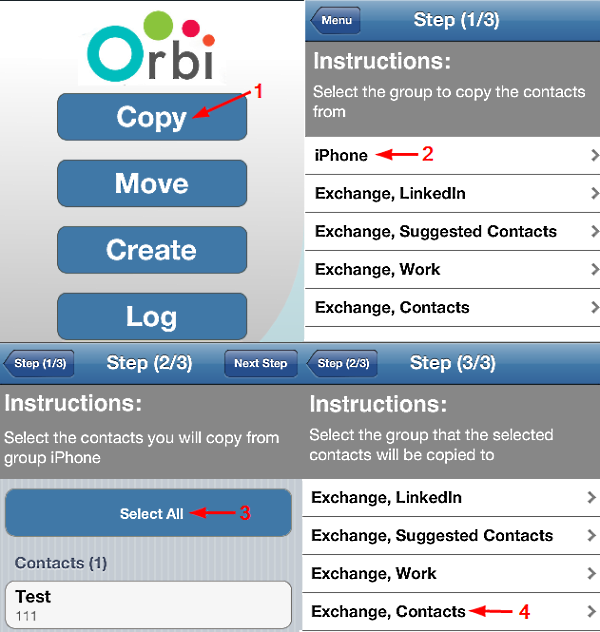 There are a few paid apps that can move contacts across the groups, or another popular solution is to “share” the iPhone contact and email it to yourself, from there you can save it as a contact in the right group. After a bit more digging I stumbled across Orbicontact which was free is only £0.69/$0.99 and has the functionality needed. The contacts should now appear in Outlook and/or the new iPhone. The move function of this application has been reported to copy the contact name without the number resulting in data loss. Please use the copy method or look for an alternative application. Exfolders is a replacement for the tool PFDAVAdmin which is no longer supported with Exchange 2010. Microsoft have dropped WebDav in Exchange 2010 and replaced it with Exchange Web Services (EWS). The utilities are practically identical gui wise, and the following method of setting permissions works with both Exfolders and PFDAVdmin so this covers Exchange 2003 / 2007 / 2010. Give a user permission to access all calendars. In this example Reception need to be able to edit all calendars. Giving User1 access to User2’s calendar. As you can see, Exfolders/PFDAVadmin are perfect for quickly modifying calendar permissions. This is a question I’ve seen pop up a lot which can be achieved multiple ways. If you are looking for a fully fledged signature manager I would recommend something like CodeTwo’s ExchangeRules, you can trial this without paying if you don’t mind an advert being appended to your email, otherwise their prices are pretty reasonable. Anyway, today we will look at the free way! There are 3 parts to achieving the goal. This creates a very simple signature which pulls attributes from active directory.